You are here: Home / Our Animals / Chickens / Make A Dust Bath For Chickens In Just 5 Minutes! If you haven’t yet built a dust bath for chickens, now is the time to start. But why do chickens roll in dirt anyway? What dirt is best in my dust bath for chickens? 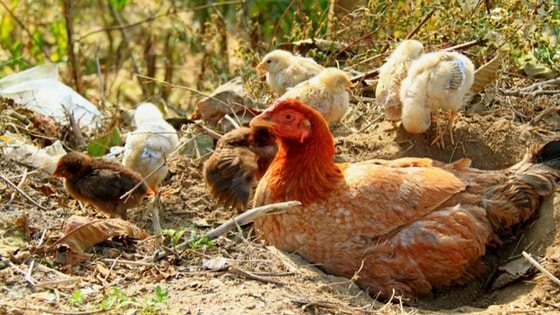 Dust bathing is a very natural and necessary part of your chickens lives, and if you don’t provide one, your flock will find a way to create one in the most inconvenient spot you can imagine. I speak from experience, friends. Chickens are creative creatures, and will put a dust bath in the oddest places. Ours have had great fun digging a dust bath next to a car tire, in seedling patches, or in my potted plants. So, anything can be a possible (and massively destructive) place for them to dig a dust bath hole. 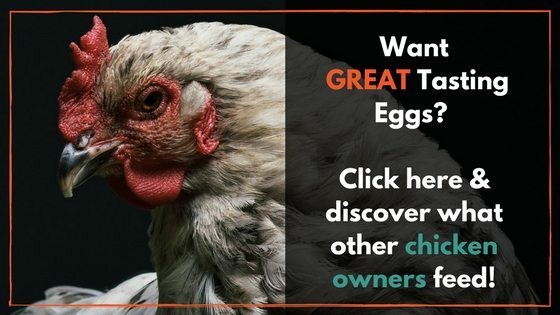 Chickens HAVE to dust bathe – it’s how they keep themselves free of external parasites that can otherwise devastate their feathers and cause all sorts of nasty health problems. A hen covered in dirt is a happy hen, and if you’ve never seen chickens rolling around and kicking earth over themselves you’re missing out. Making your own dust bath for chickens also ensures that your hens are bathing with beneficial dirt, rather than dirt caked with manure, dead and decaying matter, etc, that harbor bad bacteria that can harm your birds. You can also include parasite-preventing supplements and herbs to get your flock squeaky clean and ready to preen themselves. So, let’s talk about how to make a dust bath for chickens. While my chickens like to create a dust bath directly in the ground (and it’s not a bad decision! ), I also like to use a food-safe plastic container to make sure they’re getting goodies like wood ash and diatomaceous earth that help keep them free of mites and lice. The nice thing about a plastic bin is if it gets gross (and it will because chickens poop over everything), it’s really easy to clean. A good choice is an old kiddie pool – it’s low enough that your chickens can easily get into it, and wide enough to accommodate more than one hen. Because, let’s face it, when one chicken uses a dust bath, everyone else wants to join in, right? So, if you choose something like a kiddie pool to make a dust bath for chickens, your flock is more likely to use it. Other options are wood boxes or even a cement or mud brick bathing area. You can purchase sand or use regular ol’ dirt. We have loamy soil here (it’s mostly sand thanks to the Mississippi), so we just scoop dirt from our yard into the dust bath. If you have super rich top soil, you might want to mix it with some sand. The point is to have loose dirt your flock can easily toss over themselves. You shouldn’t have to buy dirt for this project, but if you want to, you can easily get bags of topsoil for $1 at your local big box store. Create a 1 or 2-inch layer of soil at the bottom of your container, smoothing it out so it’s even. Your chickens will mess it up quite quickly, but this step helps you judge how much diatomaceous earth or wood ash to add. Next, sprinkle diatomaceous earth over the soil. This will help to get rid of any mites or lice on your chickens and prevent them. The amount of diatomaceous earth you use will depend on the size of your container, but I like to use a 2:1 ratio in favor of dirt. If you plan to use wood ash (which will kill mites like diatomaceous earth, but isn’t as effective in my opinion), you can add it now. 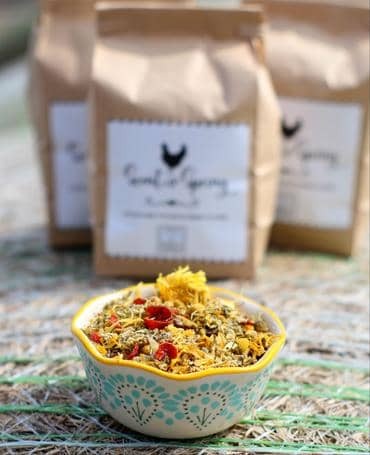 If you want, you can pre-mix the DE and dirt, but without a doubt, your chickens will do it for you. If you want, you can add herbs such as mint or sage to further repel parasites. And voila – your dust bath for chickens is done! Do you think you’ll try making a dust bath for chickens? Leave a comment below! Scholz B, Urselmans S, Kjaer JB, Schrader L. “Food, wood, or plastic as substrates for dustbathing and foraging in laying hens: A preference test.” Accessed August 13, 2016. Barnett JL, Tauson R, Downing JA, Janardhana V, Lowenthal JW, Butler KL, Cronin GM. “The effects of a perch, dust bath, and nest box, either alone or in combination as used in furnished cages, on the welfare of laying hens.” Poultry Science. 2009 Mar;88(3):456-70. doi: 10.3382/ps.2008-00168. Accessed August 12, 2016. Making a dust bath for chickens shouldn't take forever. Keep your hens parasite-free with this dust bath you can build in just 5 minutes (and for pennies). Thank you for the info. I am doing this asap. Can you give bananas to chickens? Hi Janice – yes you can! Chickens LOOVVVEEE bananas! 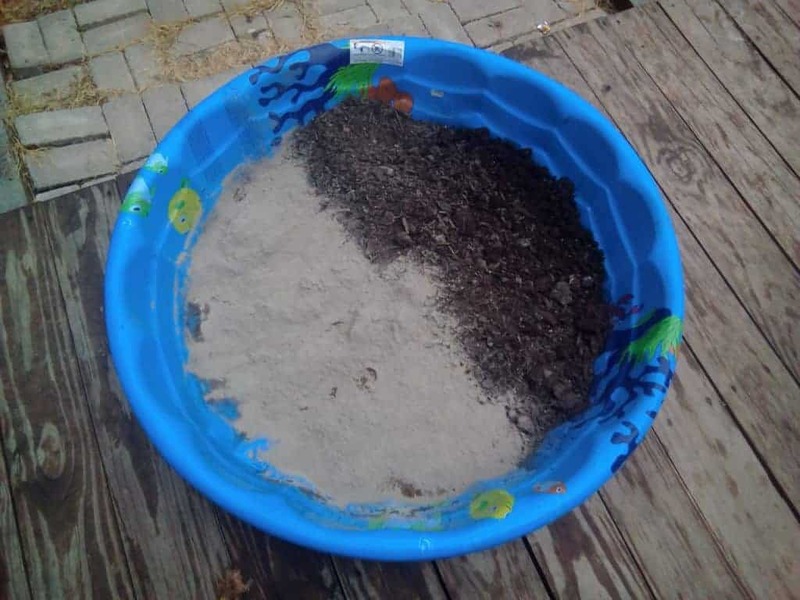 I have been using a small kiddie pool as a dust bath for my chickens, but when it rains the pool just fills with water and I’m just left with a pool of mud. Do you have any suggestions for me? I move mine out of the rain or cover it up. There’s not much else you can do. Another alternative is leaving it in the coop, if it’s big enough. 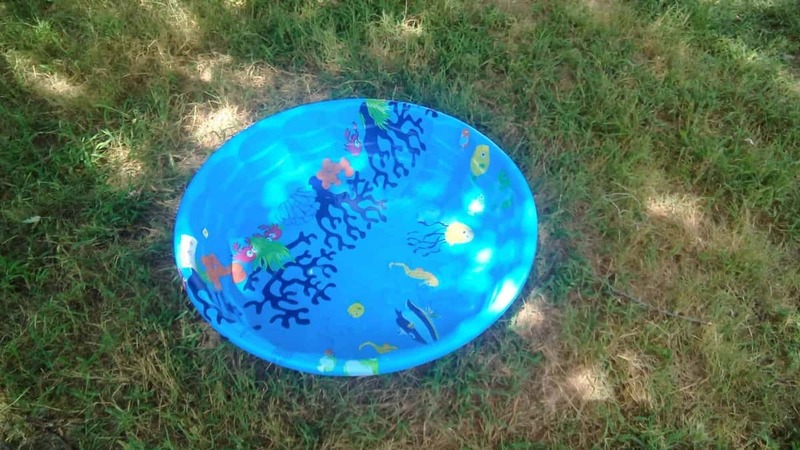 Drill small holes in the bottom of the kiddie pool so it can drain out? Where’s the best place to get DE? You can get it at any feed store. Look in the livestock feed aisle. You can also buy it on Amazon at https://thefrugalchicken.com/de That’s what I buy. Hope this helps! If you use a kiddie pool I would drill holes in the bottom for drainage. Drill several holes using a 1/2 inch size bit to allow the water to drain. If the hole is to small the dirt will clog it and it won’t drain well. Great point! But if it gets wet, the dirt +DE will still turn to muck when it gets wet. That’s a good point also. I guess I hadn’t thought of that because it’s been so dry here this summer. The dust has been more of a problem than the mud. And thank you for posting this. I’ve watched my chickens dusting there selves in the barn but didn’t realize why or how important it was. I’m still learning and always reading everything I can. But, my hens recently quit laying. I think they are done. They’re about 3 years old. Any suggestions? I don’t want to wait until the spring when they get chicks at the local farmers co-op. Where do you live? You can still get chicks shipped in from certain hatcheries. Murray McMurray I believe still ships chicks this time of year. If you live where it’s warm, you shouldn’t have an issue raising them over the winter. Just make sure when the temp dips below 80 degrees to give them a heat source until they’re fully feathered. If you live in a cold area or shipping chicks in isn’t an option, you can post on craigslist that you’re looking for hens to buy, but that’s always a crap shoot. They might be too old or infrequent layers. I live in East Tennessee. Right next to the beautiful Smokey Mountains. I have a heat lamp in the coop for the winter. It does get cold here. But this year has been unusually dry. I have heard of Murray McMurray’s but never ordered from them. Most people here seem to buy from the co-op or tractor supply. But I didn’t want to wait until the spring. I really like getting the eggs and taking care of the chickens. All my family gets eggs from me. And it gives me a sense country life, a bit of homesteading and separation from working in the city. A stress relief I guess. I enjoy any little bit of self sufficiency I can have. And thank you for your help. I made a dirt bath last fall for my hens, with sand and dirt, I didn’t have time before the snow fell so the rooster don’t have a dirt bath area yet. I’m going to use grandchildren’s sand “box” this spring as it comes with a useful cover for my upcoming wet spring. 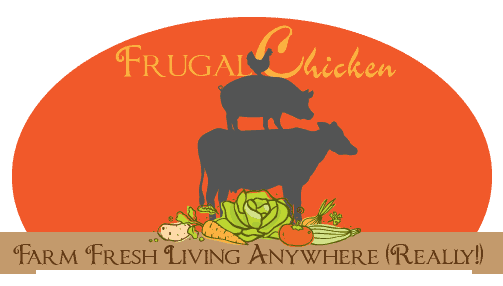 I am not new to chickens, because my dad always had a small farm growing up. But, I am new to having my very own flock and I am super excited! Got my first six chicks 2 days ago. And I can’t wait for them to be big enough to play outside! My nephew had one of those of turtle sand boxes that had been thrown out and this will be my chickens dust bath. It’s as large as a kiddie pool and shallow also it has a fitting lid. I figure at night I will keep it covered to hopefully keep my mixture fresher longer away from the elements and rain! Thanks for your recipe. I already have a bag of wood ash from Mamaw’s wood burnin stove and I plan to add dirt, small bag of sand and some DE to it! So excited to watch my chickies play!! My 8 hens and 1 rooster have been dusting in the space between my house and the edging we put in years ago. They have a large area to dust but they still choose to use the spot by the house!! I am going to try the wading pool thing and keep it in the run, which is covered. Hopefully that will flip their dusting switch!! Also, to switch gears, one of my hens has been pecking her eggs. The shell is almost paper thin. The other hens eggs are fine and she doesn’t peck them, even if she is laying in the same nest box (I have 6 boxes) . I have put out oyster shell calcium for them to eat whenever they need it besides their laying mash and scratch. Is there anything else that can be done to toughen up her shells? I tried putting fake eggs in hoping she would peck them and tire of it when she had no results, but that hasn’t seemed to help. TY for any advice. Calcium is the issue. It sounds like she’s either not eating the supplement even though it’s available, or there’s some calcium absorption issue. I thought DE was bad to breath for chickens as well as humans. It’s not great to inhale, which is why I recommend chickens be outside if you use it in the coop or if you use it for dust bathing. We’ve had success using it in that way with limited exposure. I want to try this for my 6 week old hens. Would just digging a hole in their coop in the shape of a kiddie pool work? You can try it! It might turn into a mucky mess in the rain though. Just got home with the DE and sand,,,,will chop some herbs from garden and get to it., I bought the plastic wash tub yesterday…thx so much for the help. I did everything you recommended but my girls won’t use it. They prefer to dig around and lounge amongst my flowers. Grrrh! Any suggestions? Chickens can be stubborn once they’ve picked a spot. If you want them out of your flowers, then I would see if there’s a way to create a barrier. If you don’t mind, then you can still get the benefits of DE by sprinkling it in the area they already like to roll in. I hope this helps!